Wind speeds are now at 105 mph and pressure is down to 954 mb. Satellite images show an eye (yellow dot) forming and a stronger central dense overcast, always a sign of strengthening. The computer models that have come in since I last posted have allowed me to become a bit more confident as to the location of landfall (between the orange lines). 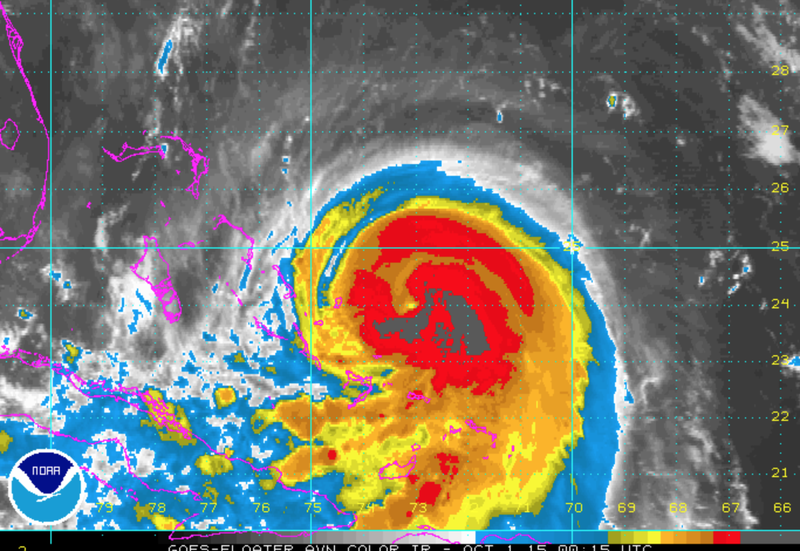 It now seems likely Joaquin will reach at least Category 3 (major) status and Cat. 4 is not out of the question. Bring in lawn furniture, trampolines and other items that might blow about. Any car not needed for evacuation needs to be in the garage or other shelter. Get plenty of cash -- twice what you think you will need -- as if you will be gone for two weeks. If the power failures, your credit card will not work. Cash is king. Fill your fuel tank for your evacuation vehicle. Take plenty of protein bars and water bottles for the trip if traffic is heavy. Batteries plus flashlights! If you have a generator, fill its tanks. Put on hurricane shutters if you have them. Put valuables in your safe deposit box or, if you don't have one, put them in another secure location. A place to evacuate to: A relative's inland home (outside a the flood plane), an extended stay hotel, etc. If you chose the latter, make sure you have a reservation. Pay for the first night with your credit card and take the reservation with you. Get one of those solar cell phone rechargers; power failures may be widespread. I'll update in the morning. Winds now 105 mph as of 8pm EDT. 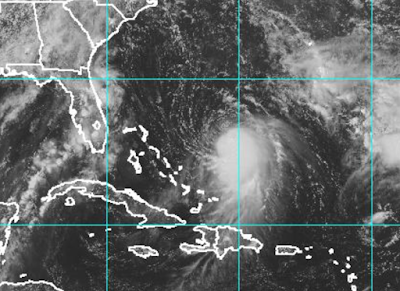 Tropical Storm Joaquin was upgraded to a Category 1 Hurricane this morning hitting sustained winds of 75 mph and promises to be a knockout, even if it never makes landfall. 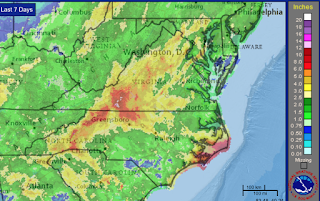 Projections are that it could dump up to 10 inches of rain over parts of the country from the southeast to New England, and is threatening to cost the US economy billions. 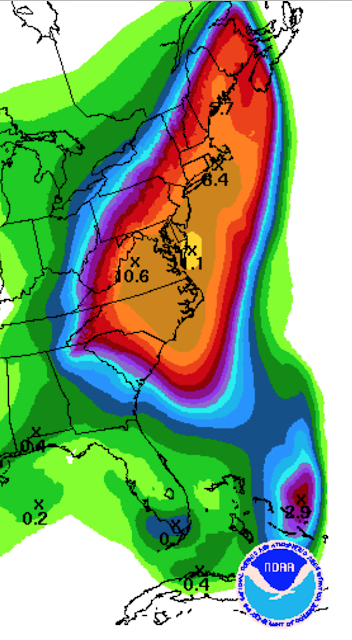 Adding to the worries, Joaquin could converge with another slow-moving storm on the East Coast and lead to devastating flooding into next week. 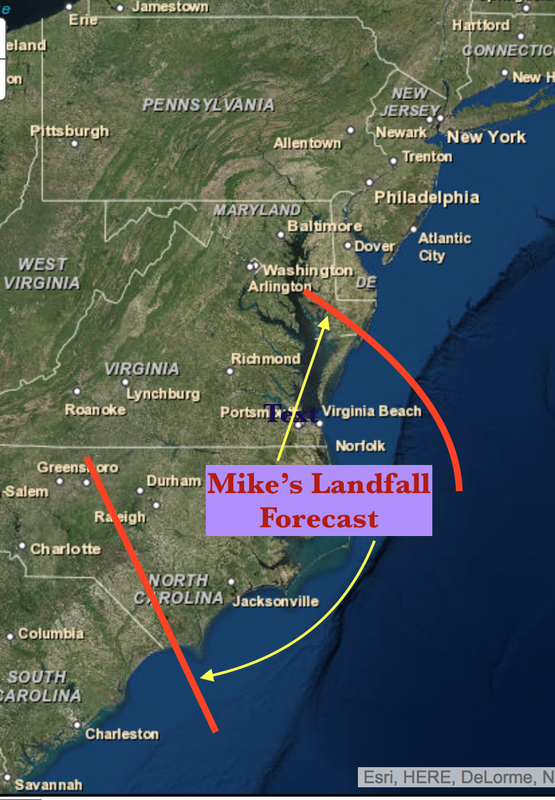 Mike was quoted today in Fortune saying that this storm has one of the most alarming rainfall forecasts he has seen, with the potential of serious catastrophic flooding from North Carolina to Massachusetts. It will also disrupt the economy with the economic impact reaching into the billions of dollars from damaged property, disruption in manufacturing, shipping companies having trouble making deliveries, cancelled flights, and preventing people from going out for shopping, dinning and entertainment this weekend. 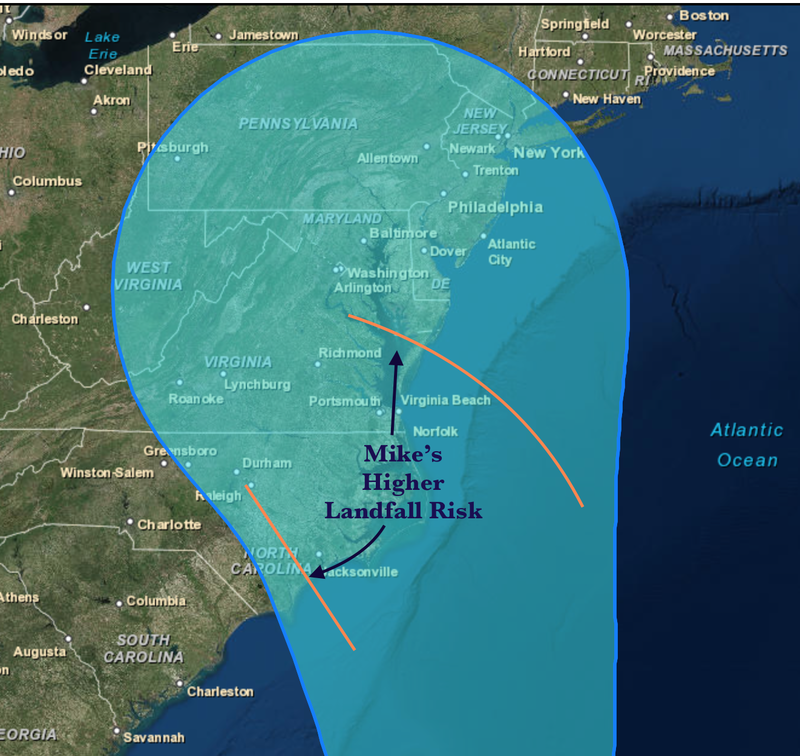 Mike also predicts that this storm has the potential to be as devastating as Sandy because of the quantity amount of water and the size of the area that will be hit. I try not to write to much "inside meteorology"on this blog since it is for the public-at-large. However, meteorologists are dealing with an extraordinary situation this evening so I hope a little "insider" information might be interesting. Normally, at this point in a major tropical weather system, the "models" (computer simulations of the future state of the atmosphere) start coming together geographically. 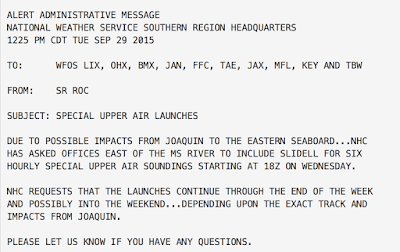 Today, they are doing anything but converging with regard to Hurricane Joaquin. Courtesy of Dr. Ryan Maue, here is a plot of all of the different model solutions. It is breathtaking in its breadth. This is a huge issue. 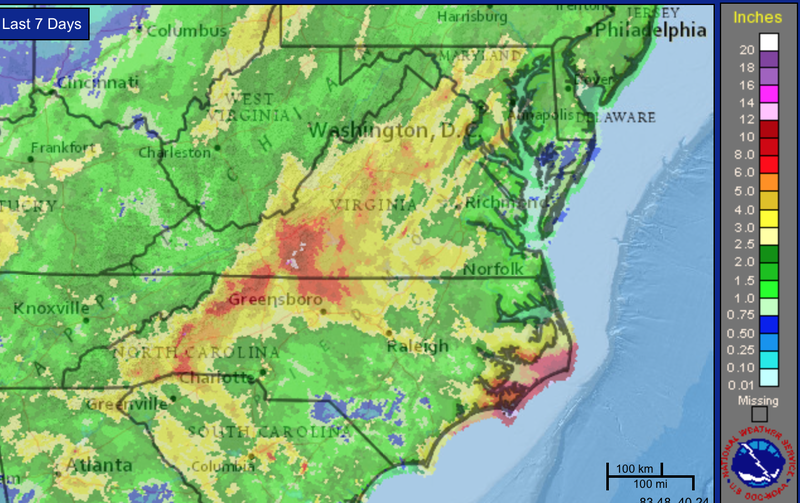 As much as 14" inches of rain have fallen in western Virginia in the past seven days (see map below). The red areas have received more than five. So, given the wet ground, if high winds occur, trees will be uprooted at speeds much lower than usual. Plus, given these rains, some rivers are already running high. Here is the National Weather Service's smoothed rainfall forecast for the next 7-days. Here is a rough estimate of the rainfall if, for example, Joaquin makes landfall in North Carolina and then stalls over South Carolina as one of the computer models indicates. Do not take this as a forecast of the hurricane's path! 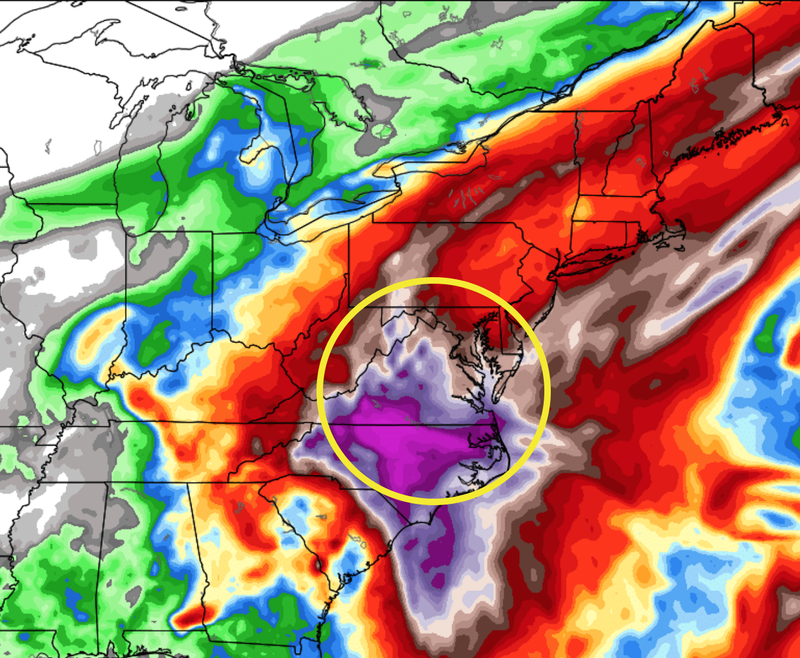 My point in showing this is that if the hurricane adds to the rainfall amounts, an area will likely have more than a foot -- with catastrophic flooding possible. 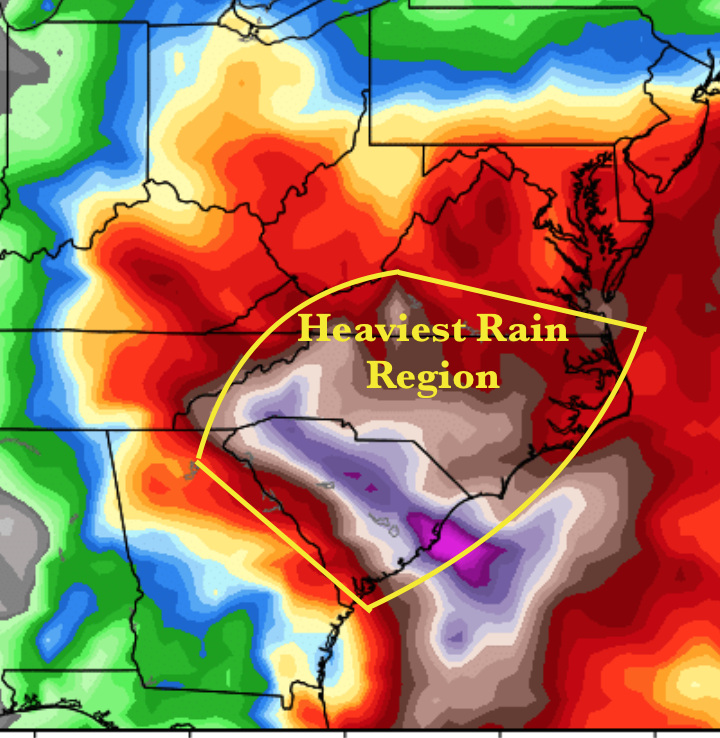 Or, if you live near a major river in the area labeled "heaviest rain region"
A full tank of fuel for your vehicle. Valuables gathered together so they can be quickly put into the trunk so you can leave quickly. A place to go: A relative's home on high ground, a motel, a public shelter, etc. If you go to a hotel, have a reservation. You may wish to consider an "extended stay" type of hotel. Be prepared to put valuable items you cannot take with you on top of tables, on the second floor, or in the attic to hopefully protect them from floodwaters. If you evacuate, turn off the gas, water and electricity. 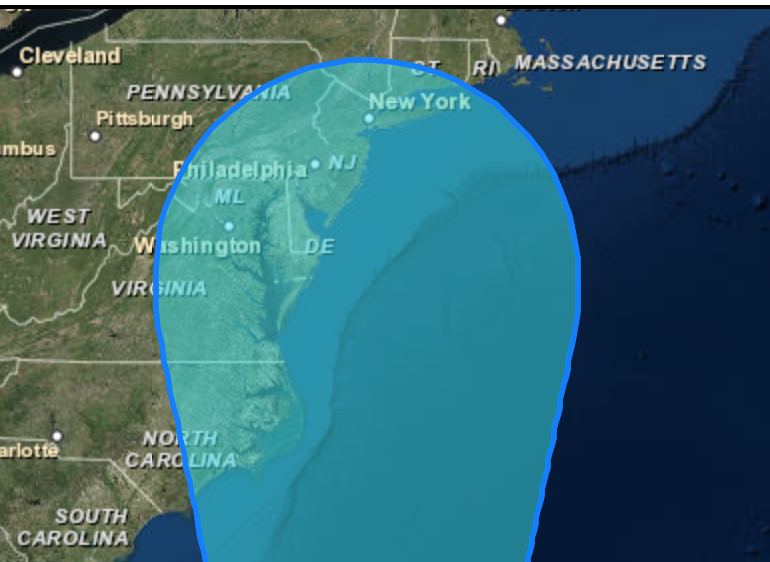 The pale blue is the National Hurricane Center's official forecast as of 5pm Eastern time. 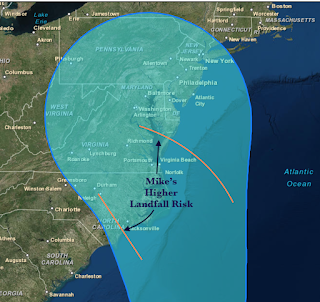 I have added (between the orange lines) where I believe the higher risk of landfall may reside. However, this entire forecast is fairly low confidence. The storm will likely be Category 1 or, possibly, a minimal Cat. 2 in terms of wind speed at the time of landfall based on what we know now. What Are We Doing Now to Reduce Uncertainty? Thanks for reading. There will be more updates as I get more information. 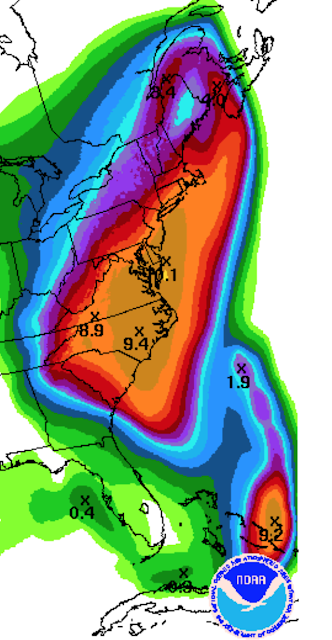 This is one of the most alarming rainfall forecasts I have ever seen. Regardless of what Hurricane Joaquin may do (see below), this forecast requires preparation, especially in the amber (>7") areas. If this forecast is correct, the resulting flooding will last more than a week and will likely overwhelm FEMA and other assistance agencies. So, you will need to plan for yourself and your family. With regard to Hurricane Joaquin, here is the latest graphic from AccuWeather. There is little doubt the hurricane will intensify to at least 110 mph winds at some point along its path but it is impossible to say what the intensity will be at landfall (if it makes landfall) because there is still considerable disagreement in the computer models and other indicators. 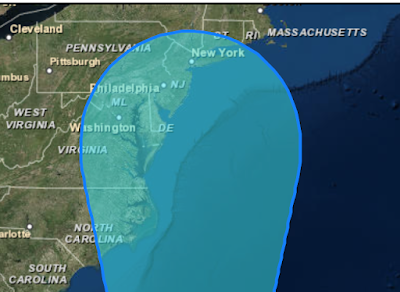 However, if you live in the dark gray area from Massachusetts to North Carolina, please monitor for future updates. Because of special weather balloons and other data gathering activities, I expect that, by this evening, we'll have a pretty good idea if it is going to make landfall in the U.S. Please check back. Here is the 8:15pm satellite image of Joaquin. I believe the storm has reached hurricane intensity and will be officially upgraded to a hurricane in the National Hurricane Center's 11pm advisory. The storm is drifting slowly west. It continues to be a threat to the U.S. The flood threat (scroll down and look at postings since noon today) has, if anything, increased based on the data that has come in since I wrote those postings. 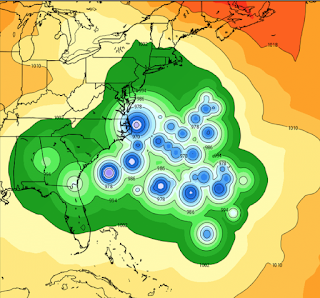 There is the potential for catastrophic flooding in the Middle Atlantic region. I will be updating the blog tomorrow with later forecasts and analysis. Please suggest it to your friends who live in the Middle Atlantic and Northeast regions of the country. A place to go: A relative's home on high ground, a motel, a public shelter, etc. 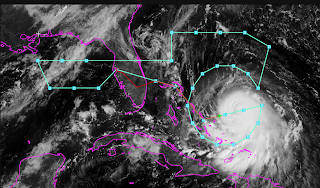 ….the expensive public relations companies employed by Big Climate are working overtime to create a variety of press releases so that, no matter where, when or how hard Joaquin hits, it will be blamed on 'climate change'? 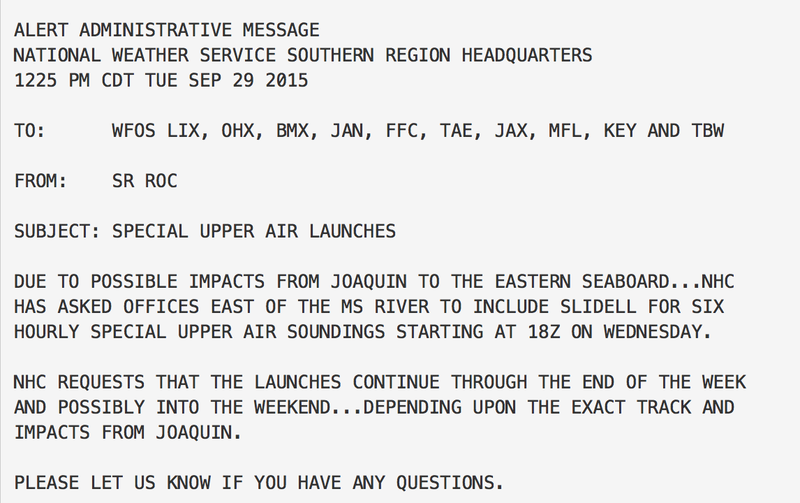 Essentially, from the Mississippi River, east the NWS is going to launch weather balloons at 6-hour rather than 12-hour intervals. They did this in the run-up to Sandy and it worked well. Given that T.S. 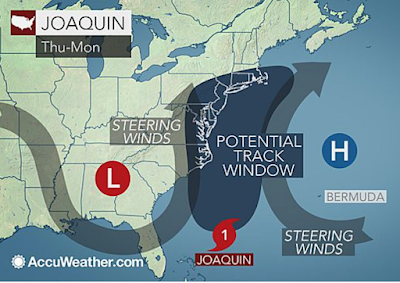 Joaquin is very near hurricane strength and strengthening, it is important to have this data to forecast the track of the (soon to be) hurricane and the very heavy rain forecast for the East Coast region. Addition: Here is a map showing the weather stations that will be launching the additional balloons. They are forecasting lower localized totals but an event that is much broader geographically. 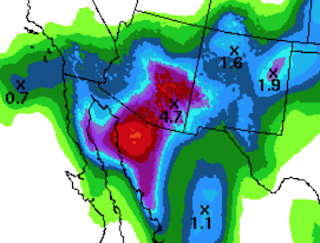 Either forecast will cause widespread, serious flooding. Since tonight's model runs will have the additional data from the Hurricane Hunters, I will try to focus in on the threat area with tomorrow morning's blog postings. 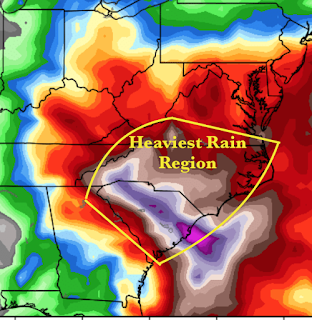 I'm confident a heavy rain pattern will set up over the East that will result in flooding. Unfortunately, is about all I am confident of at this moment. Let's break down what I know and my forecasting experience indicates. 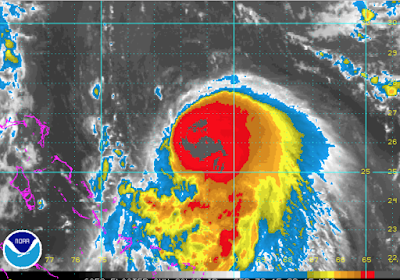 The storm, based on satellite imagery, seems to be intensifying east of the Bahamas. 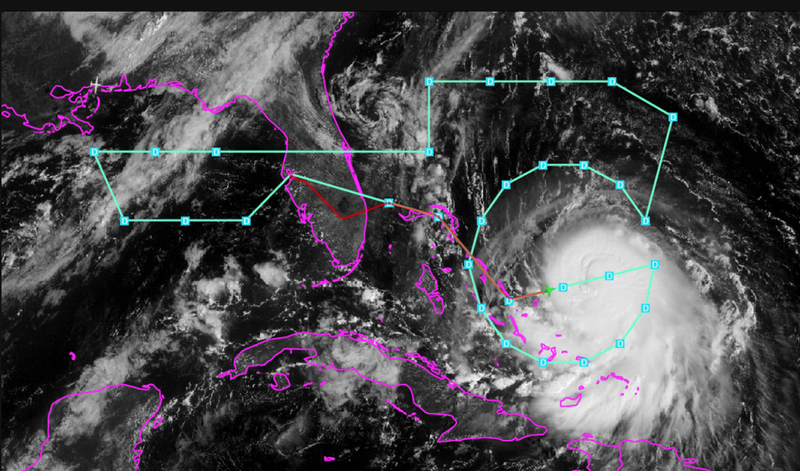 The satellite image from below is from 2:15pm EDT. The storm will likely drift west for another 12-18 hours, then begin to make a turn to the north. I am not confident as to whether it will make landfall over the Northeast or stay out to sea. It will also intensify further and may make hurricane status. We should have a much better idea late tonight and tomorrow morning as the Hurricane Hunters are just starting to investigate this storm. It will take a few hours to gather the data then about 10-12 hours for all of the computer models to make their forecasts. 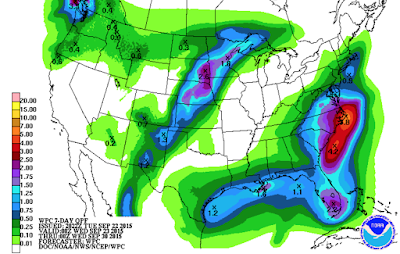 There will be two periods of heavy rain between now and Monday over most of the region. Below I have placed a yellow circle on top of one of the computer models that attempts to forecast a "storm total rainfall." Other models have the center of the heaviest rains farther north than this model. Some areas within the yellow circle will likely see ten or more inches of rain by Sunday evening but I cannot yet be more specific than the circle as to location or amounts. If I am correct as to how this storm will develop, then flooding will last well into next week. What might preparations look like? That is my advice for now. When we have more data, I will update again. You will also want to go to AccuWeather.com for the specific weather forecast for your location. 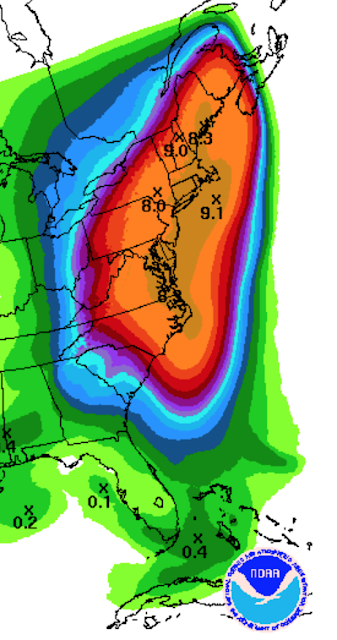 I continue to be quite concerned about the flooding risk in the Northeast. If you live in a low-lying or flood prone area, now is the time to consider what you would need to take if you are forced to move to higher ground. It wouldn't hurt to get some extra cash and make sure your car has plenty of fuel. If you live in the area outlined, I strongly suggest you keep an eye on the weather later in the week. High winds and torrential, likely flood-producing in places, rains are quite likely in some of these areas In addition, there is a risk the storm could reach hurricane intensity but that is still speculative. 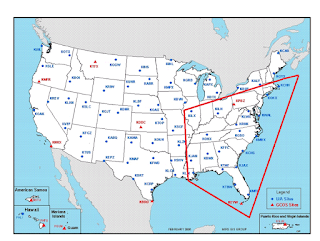 Traveling to the Northeast End of Week? If so, please keep an eye on the weather. 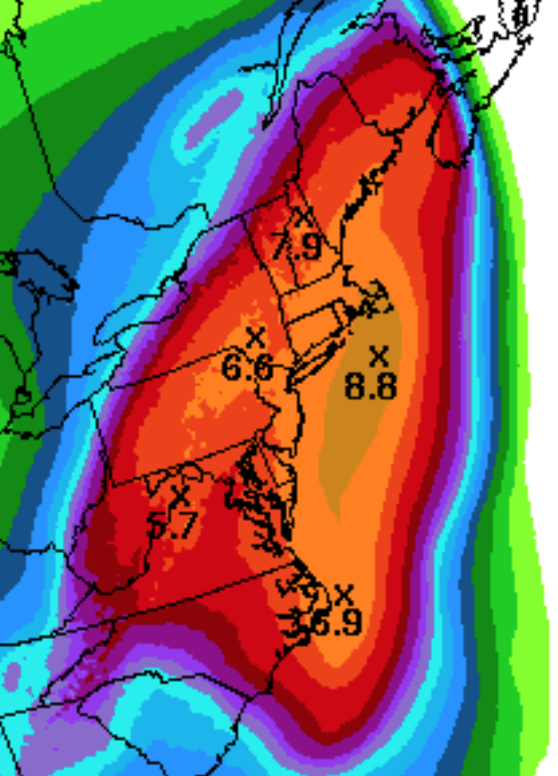 From Philadelphia to Boston it looks like there will be very heavy rain with the potential for flooding along with high winds. Stay tuned…. The list of winners is up and available here. 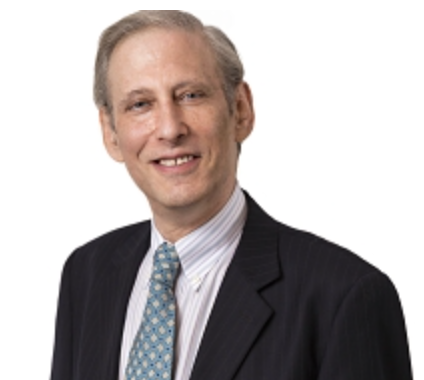 I wish to make special note of AccuWeather's Mike Sternberg who has won the prestigious Award for Outstanding Contribution to the Advance of Applied Meteorology. The recipient of this award is in rare company: Dr. Ted Fujita, Col. Robert Miller (first tornado forecast) and Dr. Paul MacCready (first human-powered aircraft to cross the English Channel). Dangerous Aspect to Building Boom in Hurricane Alley? There is a fascinating study in 538 where author Matt Lanza asks what happens when the (amazing) ten year drought of major hurricanes to hit the United States ends. But there’s a downside to those years of good weather. While the big storms have stayed away, the coastal population in the U.S. has continued to increase, and in a few cases it has been surging. When a major hurricane next strikes — and it will — it will very likely hit an area that is even more vulnerable to destruction, with a large group of new residents who might have no experience with extremes of high winds and water. I moved to Houston in 2012, one of more than 800,000 people to do so since 2008,2 when Hurricane Ike hit the area. According to the Houston-Galveston Area Council, the population of that eight-county area is expected to grow more than 40 percent through 2040 to more than 10 million people. A list published by the Greater Baton Rouge Industry Alliance earlier this year showed more than $100 billion in industrial projects proposed or underway in Louisiana. Although there are always risks because of fluctuations in oil and natural gas prices, the bottom line here is that the Gulf Coast is in the midst of a tremendous economic boom. You might ask, "what's the big deal since emergency management people will tell us what to do?" I did an informal survey at an EM meeting to which I spoke in Ft. Worth and found there has been tremendous turnover in their ranks along the Gulf coast. We are losing "institutional memory" fast. It is possible that may lead to less than optimal decisions when a major hurricane looms. 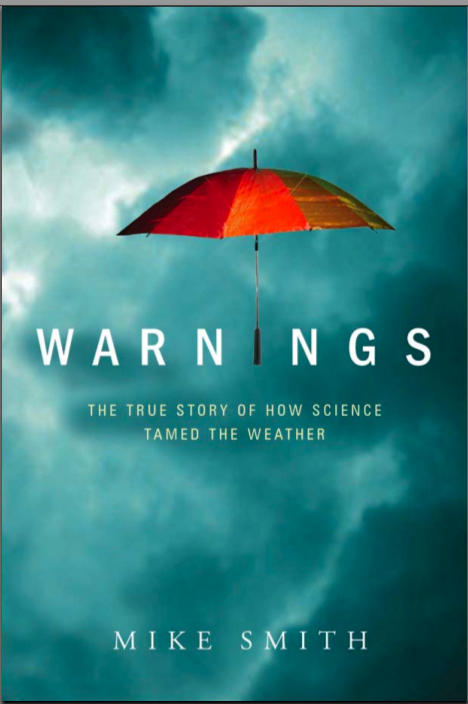 I used this photo of Warnings in a brand new home to illustrate that it, too, has stories of major hurricanes and what occurs when poor decisions are made. While we have another month when a major hurricane might form and hit the U.S., there is nothing out there now. So, more likely than not, we will go into an eleventh straight hurricane season without a Cat 3 hurricane or stronger to come ashore in the USA. We may need to begin thinking about institutional memory before the loss becomes greater. 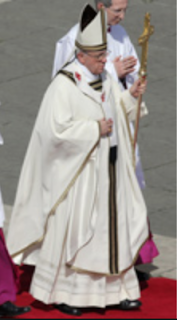 Pope Francis is in America. There is an excitement in the air that America's seventy million Catholics don't normally have unless we are asking forgiveness for it afterwards. Downbursts usually occur in "families" and that is the case this evening as a second distinct downburst (at this point, a "microburst") has occurred from a second thunderstorm that formed on the original downburst's gust front (scroll down). 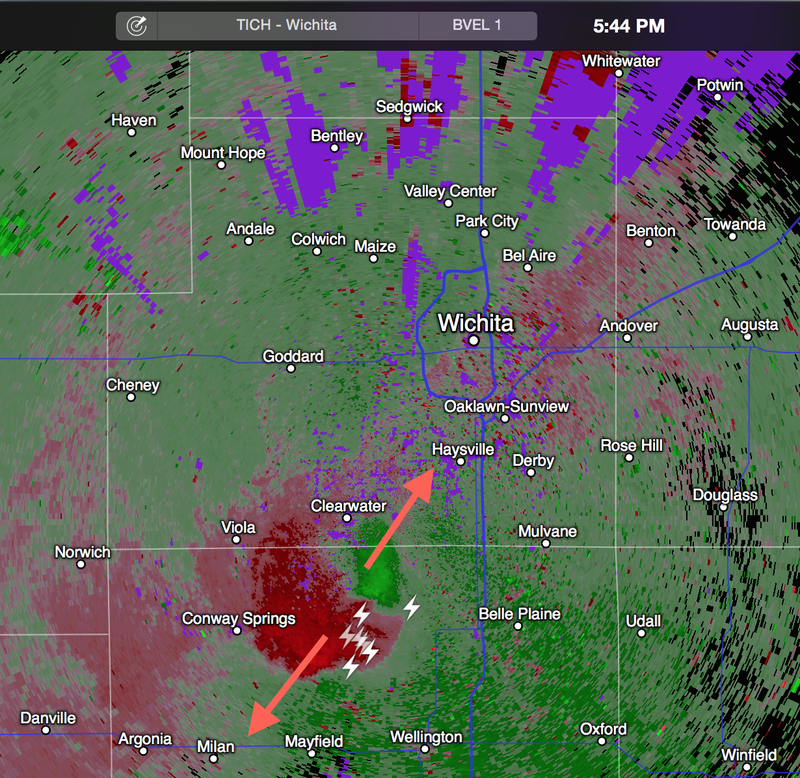 Here is the Doppler wind data as of 6:10pm. The original downburst's winds are the thicker arrows. The second downburst, to the northeast, is shown by the thinner arrows. Here is the latest reflectivity data at 6:18pm. 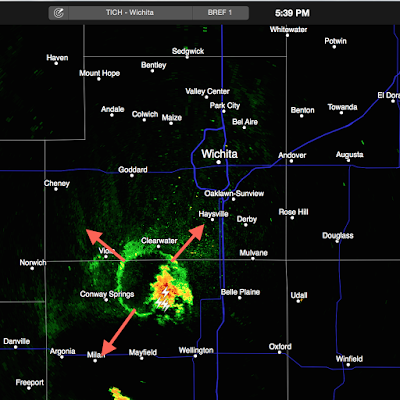 You can see the second thunderstorm south of Haysville which caused the second microburst. 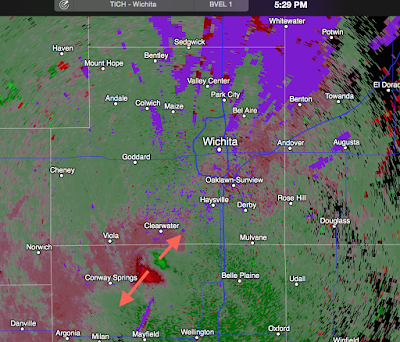 An absolutely classic downburst is shown by the Doppler wind data south of Wichita. 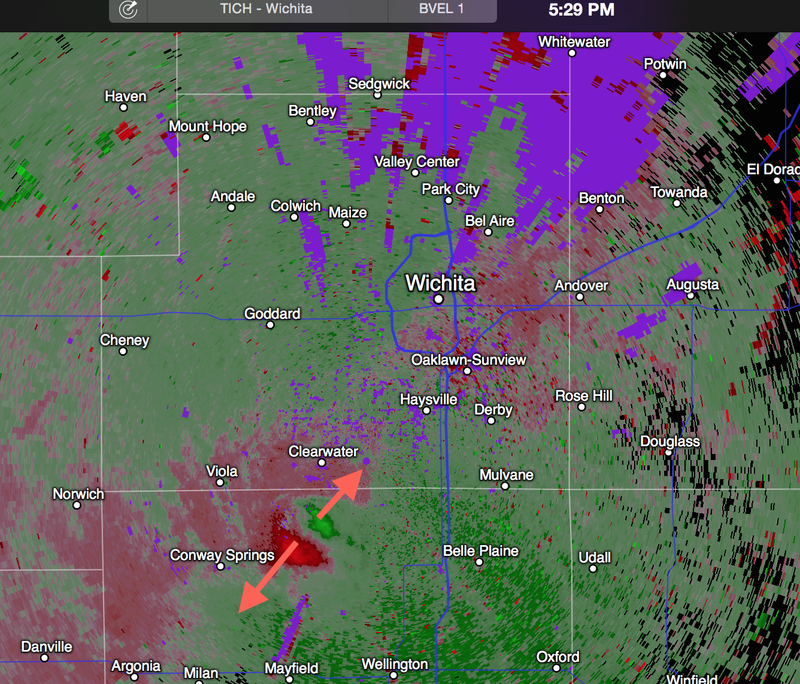 At 5:44pm, you see the green winds blowing toward the radar (~35-40 mph) and red winds blowing away from the radar. The "zot" symbols are cloud-to-ground lightning locations. It is common for lightning to flow from the thunderstorm to the ground in the downburst's rain shaft. There is another sign of the downburst in the reflectivity data (the type you see on TV).The thin, circular line is called a "gust front" by meteorologists. The reason the thunderstorm is not in the center of the ring is because it has been moving southeast during the few minutes since the downburst first hit the ground. 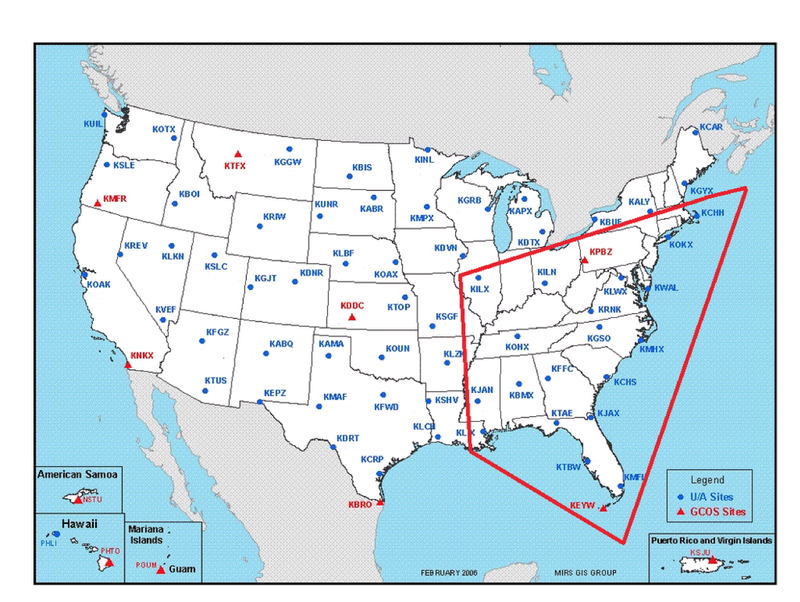 These are the types of storms that used to cause horrific airliner crashes. However, through the work of weather science, more than a thousand lives and literally billions of dollars have been saved. We keep hearing about the non-existent conspiracy among the people who doubt that global warming will be a catastrophic issue, a topic I've written about a number of times (as recently as last week). It appears the conspiracy crowd is simply engaged in projection. Investor's Business Daily has an alarming report pertaining to how Big Climate links together to influence both units of state and federal government. 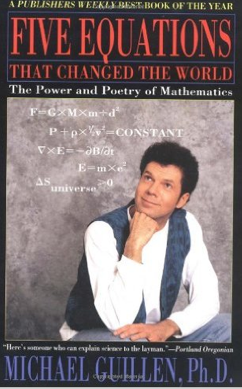 This book is a great teaching tool. One can learn much about the history of severe weather prediction, including the technological developments, the reporting progression, and the understanding of severe weather. Though I grew up in Tornado Alley, I learned much about tornadoes I had not known. The photos were of great help in visualizing the concepts or events being described. Reader after reader rates Warnings with the highest rating. Pick up a copy…you'll really enjoy it! Ever Notice How the People Who Claim to Be Most Concerned About Global Warming Never Act in Accord With Their Concern? Pollster J. Ann Selzer has an interesting poll out this morning pertaining to how Americans view Pope Francis. His position on global warming is particularly unpopular, which doesn't surprise me. Things are pretty calm these days. 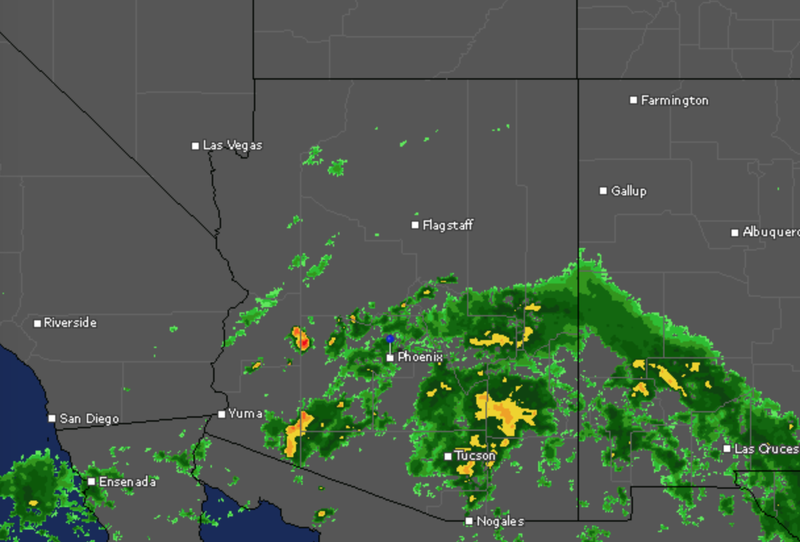 Here is the radar as of 1:30pm Arizona time showing that heavy rains have developed as forecast. Areas of flooding are likely. Remember: Turn around, don't drown. 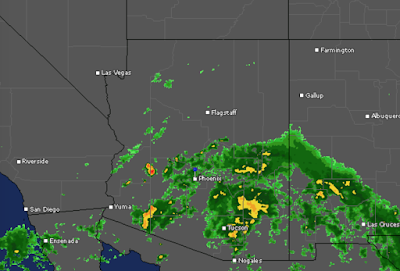 More than four inches of rain are forecast to fall in parts of Arizona the next few days. Please be aware of the risk of flash floods and turn around, don't drown. The photo above is some of my trains whizzing around a Christmas train layout at Towne West Square in Wichita. Why am I bringing this up in September? There are a lot of train clubs around the nation and there are a lot of empty spaces in malls these days. 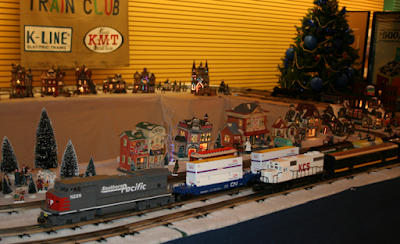 It has been found that a well-publicized train layout brings people into the mall and brings new members to the train club. Some even have a voluntary donation can for the train club, so it can be a source of revenue. But, all of this works only if there are enough volunteers. So, if running trains in front of adoring children sounds like fun, you may wish to contact your local train club now, in plenty of time before the rush. An essay well worth reading. It just came to my attention that a number of people who call themselves climate scientists have called for a criminal (i.e, people go to jail) probe of those who do not believe global warming is an urgent crisis. Their disgusting letter to President Obama is here. This isn't science, it raw advocacy in its most dirty form. Their 'evidence' of what they call a "conspiracy" are a number of reports by the same people that quote the same old canards, many of which are more than 15-years old. Because it is their most recent 'evidence,' I read the entire Union of Concerned Scientists' (UCS) report which is here. With one exception, their evidence is a complete joke. The fact that a conservative group funded research is no more evidence of a conspiracy than, for example, World Wildlife Fund funding research. Three 1998's and one 2002. This is typical throughout the report. Their one point about which I completely agree is setting up phony 'grassroots' organization is wrong regardless of the fact it is done by both sides of this issue. This was apparently done several years ago by an energy group about whom I had never previously heard. All of this is being done to poison the well by making false allegations leading up to the Paris climate talks later this year. It is pure politics, not science. It is also a disgrace. What you have done with your letter is the worst kind of irresponsible advocacy, which is to attempt to silence scientists that disagree with you by invoking RICO. It is bad enough that politicians such as Whitehouse and Grijalvi are playing this sort of political game with science and scientists, but I regard it as highly unethical for scientists to support defeating scientists with whom you disagree by such methods. Since I was one of the scientists called out in Grijalvi’s witch hunts, I can only infer that I am one of the scientists you are seeking to silence. You have signed the death warrant for science. Please read Dr. Curry's entire piece at the blue link above. For some reason USA Today gave valuable newspaper space to someone named Bruce Friedrich of something called Farm Sanctuary to tell us "[he] is watching" to see whether the Pope eats meat when he is in the United States because of -- you guessed it -- global warming. As a practicing Catholic, I can confidently inform Mr. Friedrich that there is nothing in Catholic doctrine or teaching that forbids the consumption of meat except on Ash Wednesday and Good Friday. The 2015 National Weather Festival will be held on the Oklahoma University campus on Saturday, October 31, 2015 from 10:00 a.m. to 2:00 p.m. The festival will feature all things weather related, including information to keep you safe and products to protect your home. The festival event will also showcase children's activities, weather superheros, local TV meteorologists and storm chasing vehicles. The sponsor for the event is the National Weather Center, 120 David L. Boren Blvd, Norman, Oklahoma 73072. Normally, we do our light-hearted postings on Thursdays but I wanted readers to see this announcement. For $100, you get seven weeks of unlimited pasta. Mamma Mia that's a spicy offer! After the Chilean earthquake, a tsunami has struck their coast. The U.S. National Weather Service has issued a tsunami watch for Hawaii. A watch means to make preliminary preparations and listen for an all-clear or an upgrade to a warning which means to move to higher ground. I am not live-blogging this but I want my readers to make sure that their friends and relatives are aware. Mike Smith will be speaking at the El Dorado Rotary Club on Wednesday, November 4, 2015 where he will be sharing his presentation CSI: Meteorology with the audience. His presentation highlights the discovery of the microburst which was responsible for bringing down so many commercial jets in the 1970's, 80's and early 90's. Mike and his friend and mentor, the late Dr. Ted Fujita, worked behind the scenes and have made everyone who flies today much safer. If your business, club or organization is interested in having Mike speak at a future event, please contact me at mindy@mikesmithenterprises.com. Fewer Hurricanes to Threaten the United States? I have said many times that I would be fine with renewable energy if some its inherent issues could be solved. One of them, on which I have posted in detail twice, is the inability of the electrical grid to handle more than a trivial amount of "green" energy. Today, California often gets as much as 30% of its power from renewables; there are periods of the day when production can soar to 40%. California legislators just approved a plan that would require half of all power to come from renewables by 2030. Still, the tipping point the power industry feared hasn’t materialized. So, here is the other side of the story. I hope they are correct. Time will tell. Courtesy of Dennis Cross (Forecaster Evie's other grandfather and a proud Navy vet) here is an excellent version of several Four Seasons' songs performed Jersey Boys style. Enjoy! One of the theories of global warming is that the polar regions will warm faster than the tropics. If that is true (I think it is questionable), the "temperature gradient" will weaken which means, in general, less wind. We learned about the temperature gradient and its relation to wind in Meteorology 101 (really). Very pleased to announce that the NOAA National Weather Service has licensed patent technology from AccuWeather. "The National Weather Service and AccuWeather have worked closely together to ensure the safety of businesses and individuals across the United States, helping citizens to become better prepared for severe weather," said Barry Lee Myers, CEO of AccuWeather. "We are proud to be at the forefront of this ground-breaking government and weather industry partnership and thank our colleagues at the NWS for their diligence and dedication, joining together to bring the advantage of AccuWeather's proprietary technologies forward to improve people's lives." Myers added, "The license value of AccuWeather's technology patents is worth upwards of seven figures per license, but AccuWeather provided this license to the NWS at no cost, as a public service." The full details are here. 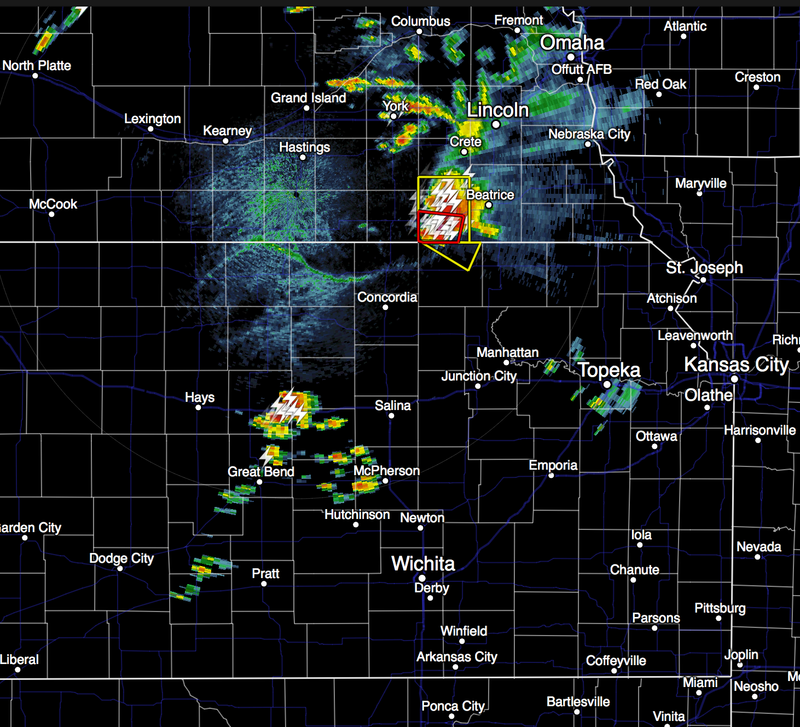 There is a risk of tornadoes later today in a small area of the central Plains. 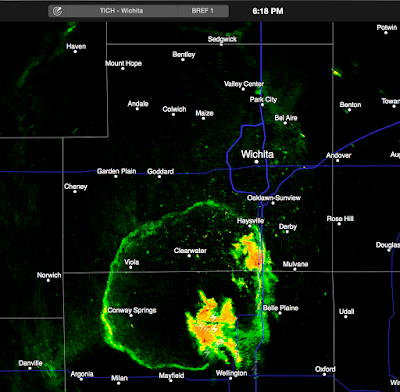 I recommend keeping an eye on the weather in this region. Want a great book? Even though it sounds like a boring topic, it is very interesting and and a fresh idea for a biography. Highly recommended. With the refugee crisis, this is the last thing the nation of Turkey needed. I was surprised to hear the siren. 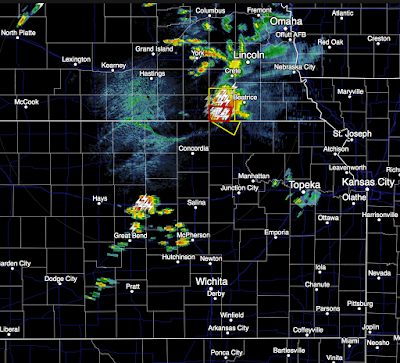 No sooner did I get the below posted was the warning extended into Kansas. The arrow points to the likely location of the tornado as it moves ESE. 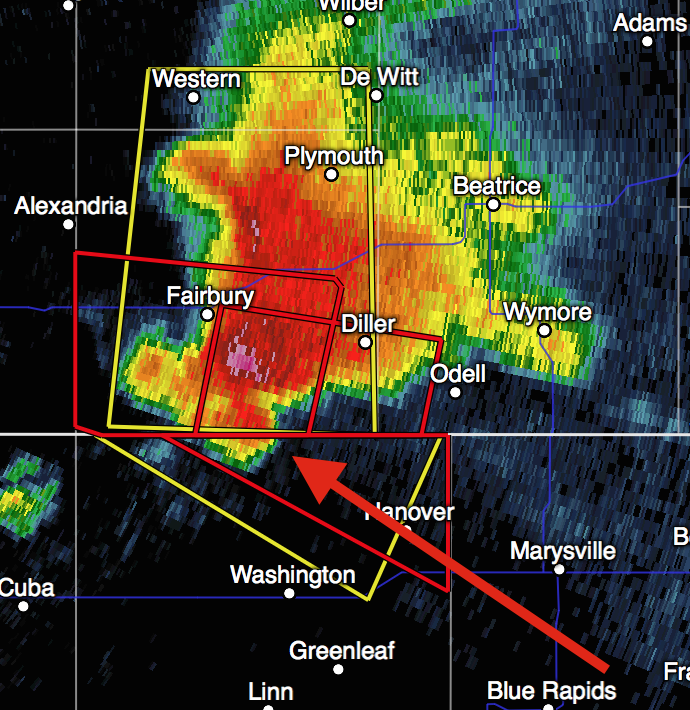 Take cover in the red polygon! (the "zot" symbols) on this image. If you have friends on area lakes, I recommend getting off the lake at the very first sign of the approach of a thunderstorm. 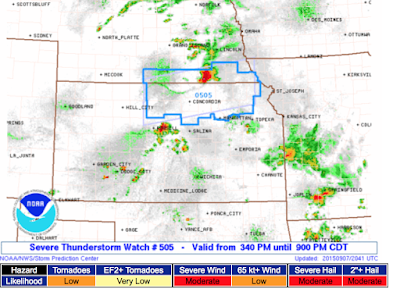 In spite of the tornado warning, the NWS has issued a severe thunderstorm watch until 9pm for the Kansas-Nebraska border area as outlined below. 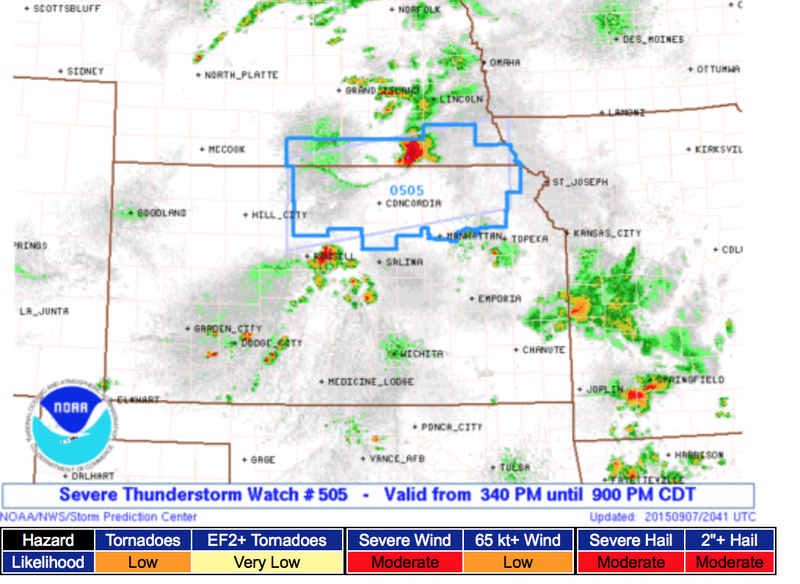 A severe thunderstorm watch is a forecast of damaging thunderstorm winds and large hail. The brown shaded area has a significant risk of tornadoes this afternoon and evening. If you have friends who will be outdoors at that time, please let them know. I will update at least once this afternoon. A necessary part of weather forecasting is the launch of weather balloons and their instrument packages. 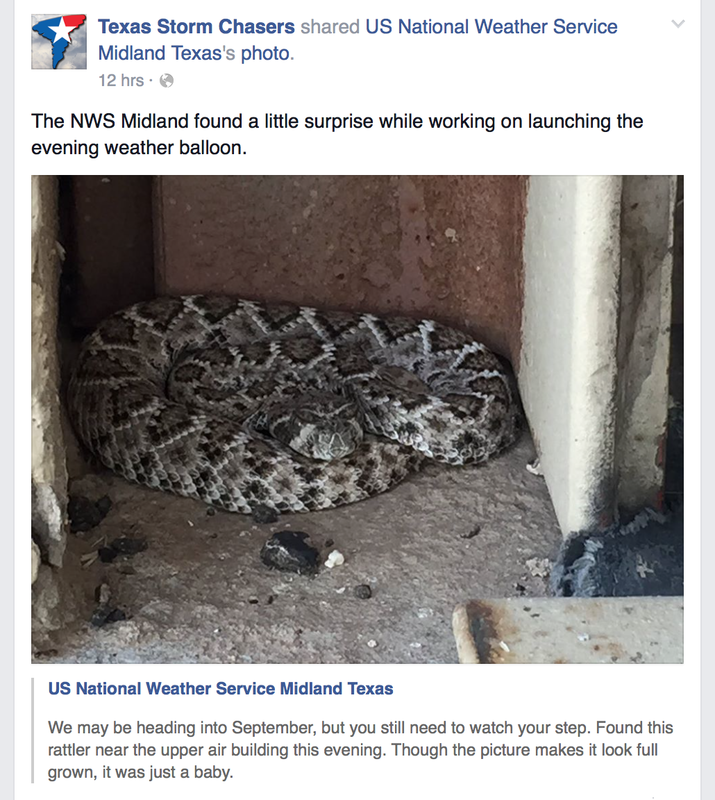 When the NWS in Midland, TX went to launch the evening balloon last week they found this little surprise. Yes, that is a poisonous rattlesnake. About 20 years ago, an NWS employee was attacked and killed by a polar bear in Barrow, Alaska. So, thank you NWS. Fortunately, as Bob Dole would say, I have "an indoor job with no heavy lifting." 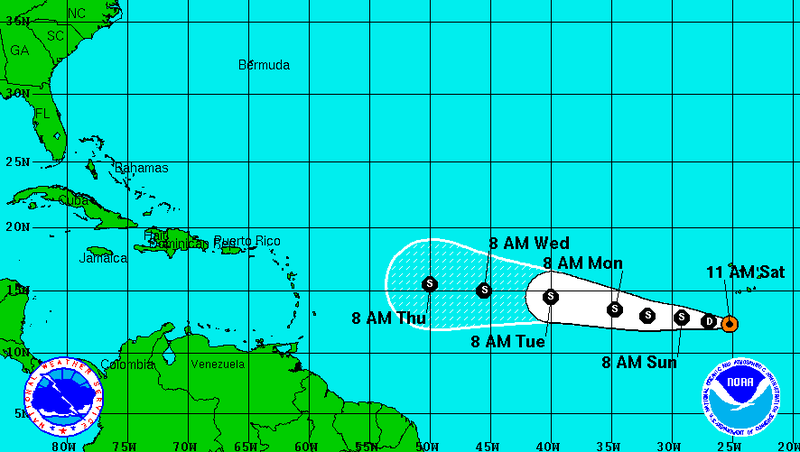 Yes, there is a new tropical depression way out in the Atlantic. 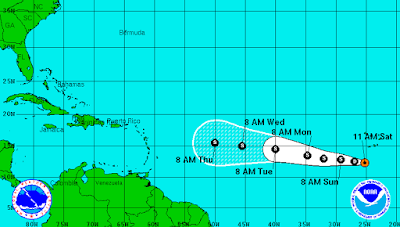 Note that is is not forecast to become a hurricane in at least the next five days. It would be at least ten days before the US would need to worry about it. My advice (in spite of what at least one television outlet is saying): Chill! 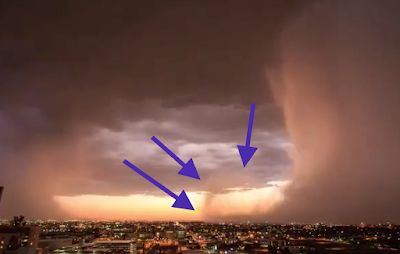 There is a popular video of a downburst on Facebook this morning showing two rain shafts over Phoenix in time-lapse. 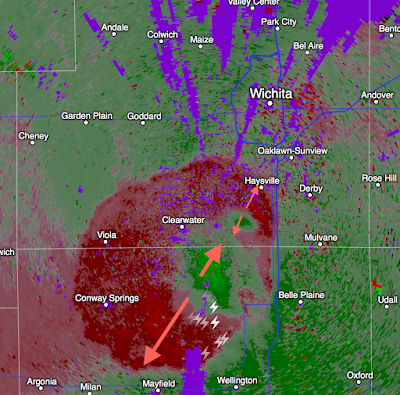 The curl on the leading edge is the telltale indicator of a downburst. How Many Trees Are There on Earth?